Investigating Earth Systems was designed to lead middle-school students through a complete and thought-provoking exploration of Earth’s systems and how they are all connected. Understanding that the Earth is a dynamic system and that it affects living things engages students and make the content more relevant. Investigating Earth Systems highlights science practices. The curriculum teaches students how to use science practices–to develop and use models, plan and carry out investigations, analyze data, and construct explanations, as described in A Framework for K-12 Science Education. Investigating Earth Systems was written by geoscience experts. We all turn to experts when we want the right advice…and in Earth science, those experts are the 250,000 geoscientists at AGI. Investigating Earth Systems was developed by the Education Department of AGI, with support from the National Science Foundation and AGI Foundation. 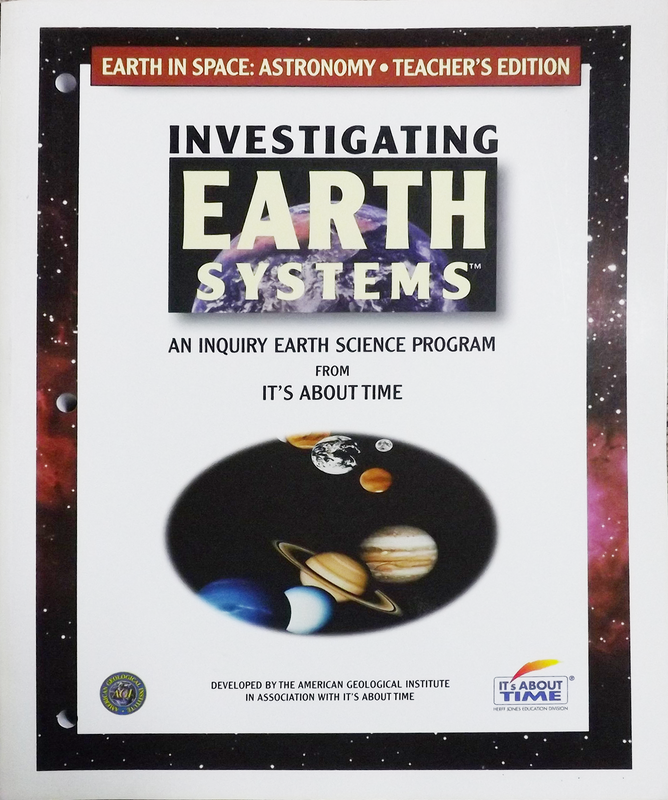 Investigating Earth Systems was developed for ALL students. Investigating Earth Systems can be tailored to meet the needs of all students. A pre-assessment for each unit targets the major concepts and understandings. Strengths and weaknesses in students’ understandings, their misconceptions, as well as their abilities to communicate that understanding to others can be evaluated and used to guide instruction. Students learn more than just where their electricity and heat come from. Investigating Energy Resources develops students’ observation, recording, collaborating, and problem-solving skills. Students investigate sources for energy, such as solar, wind, hydropower, coal, oil, and natural gas. Through a series of inquiries, students investigate how these energy resources are converted into electricity. They also discover how fossil fuels are formed and found. Most significantly, students learn the importance of energy conservation and alternate ways to use renewable sources of energy. Students are engaged in a compelling and deep exploration of space through questions, investigations, modeling, animations, and stimulations. Fascinating facts about space exploration, the Moon, the tides, the Solar System, the galaxies, and the universe are supported by both interacting with experimental investigations and easy-to-grasp text. Students discuss the evidence of the Big Bang Theory and the origin of the universe. Students explore the elements of weather by using various classroom-built instruments and by discussing other weather instruments. The Beaufort scale and the cloud types are also covered. Students learn the difference between weather reports and forecasts. They also learn to read a weather map and to relate it to their own local conditions. The text also explores the causes and effects of weather. Students also investigate evidence for climate change over time and the effects of global climate change in their geographic areas. Students become paleontologists who research an unknown fossil using Key Questions in the module and a geological map. Students learn what a fossil is and how it is formed. Fossil creation exploration includes type of organism, sediment, lack of oxygen, and geological factors. The “Wheel of Fossilization” game brings more clarity about the process of fossilization to students. Students explore how dependent they are on minerals in materials they use every day, from electronics to bikes. Using modeling, the class develops a “resource trail” for a chosen household object, from extracting the source minerals to its manufacture. Students also understand the importance of minerals as a natural resource. Students investigate and hypothesize on Earth’s processes. Using four types of modeling (physical, conceptual, mathematical, and numerical) students study how the interior movement of Earth affects the outside. This includes experiments and discussions about lithospheric plates, earthquakes, volcanoes, mountains, and continental drift. Finally, students write a brochure on what to do during a natural hazard and how Earth will be altered. Students discover different types of rocks, explore how they were formed, and how physical, chemical, and biological weathering affects these rock types. Students’ experiments lead to their discovery of how landforms are created. Students analyze topographic and geologic maps, including one of the Grand Canyon. At the end of the course, students design an informational product for locals and visitors about the rocks and landforms in their area. Students investigate the type of materials in the construction of soil. The amount and movement of water is also investigated. Students learn to separate samples of local soil and define its physical, chemical, and biological components. Applying the data they have collected with their regional topography, students plan a garden that will thrive in their region and with their soil types. Students discover that water cycles throughout Earth’s Systems. They investigate how water is used, where their water supply comes from, the properties of water, and water management. Students will also explore life without water and the activities on Earth that would cease to happen. Ann Benbow is Director of Education, Outreach, and Development at the American Geological Institute (AGI) in Alexandria, VA. After teaching science (biology, chemistry , and Earth science) in high school, elementary school, and two-year college, she taught elementary and secondary science methods at the university level. She worked in curriculum development and teacher education for the Education Division of the American Chemical Society for over twelve years, followed by three years in research into older adult learning for a Washington, D.C.-based nonprofit organization. She has directed many federally and privately funded national projects in STEM education in the areas of curriculum development, teacher education, video production, adult learning, and informal science. Benbow has co-authored a college textbook on elementary science methods, a book on improving communication techniques with adult learners, and recently co-authored a series of life science children’s books. Benbow has a B.S. in Biology from St. Mary’s College of Maryland, an M.Ed. in Science Education, and a Ph.D. in Curriculum and Instruction from the University of Maryland College Park. Colin Mably has been a key curriculum developer for several NSF supported national curriculum projects. As learning materials designer to the American Geological Institute, he has directed the design and development of the IES curriculum modules and also training workshops for pilot and field-test teachers. Mark Carpenter is an Education Specialist at the American Geological Institute. After receiving a B.S. in Geology from Exeter University, England, he undertook a graduate degree at the University of Waterloo and Wilfrid Laurier, Canada, where he began designing geology investigations for undergraduate students and worked as an instructor. He has worked in basin hydrology in Ontario, Canada and studied mountain geology in the Pakistan and Nepal Himalayas. As a designer of learning materials for AGI, he has made educational films to support teachers and is actively engaged in designing inquiry-based activitIes in Earth system science for students of various ages. Matthew Hoover serves as Education Specialist for the American Geological Institute, developing Earth science educational resources and curriculum programs at the elementary , middle, and high school levels. He received a B.S. in Geology from Boston College, an M.A. in Environmental Policy from George Washington University, and an M.Ed. in Curriculum and Instruction from George Mason University. As a certified teacher, he has taught elementary and middle school Earth, life, and physical sciences. Prior to joining AGI, he worked for NASA ’ s GLOBE Program, coordinating teacher trainings and designing environmental science investigations and learning activities for K–12 students. John Southard received his undergraduate degree from the Massachusetts Institute of Technology in 1960 and his doctorate in geology from Harvard University in 1966. After a National Science Foundation postdoctoral fellowship at the California Institute of Technology, he joined the faculty at the Massachusetts Institute of Technology, where he is currently Professor of Geology Emeritus. He was awarded the MIT School of Science teaching prize in 1989 and was one of the first cohorts of first MacVicar Fellows at MIT, in recognition of excellence in under- graduate teaching. He has taught numerous undergraduate courses in introductory geology, sedimentary geology, field geology, and environmental Earth Science both at MIT and in Harvard’s adult education program. He was editor of the Journal of Sedimentary Petrology from 1992 to 1996, and he continues to do technical editing of scientific books and papers for SEPM, a professional society for sedimentary geology. Dr. Southard received the 2001 Neil Miner Award from the National Association of Geoscience Teachers. Michael Smith was Director of Education at the American Geological Institute in Alexandria, Virginia. Dr. Smith worked as an exploration geologist and hydrogeologist. He began his Earth Science teaching career with Shady Side Academy in Pittsburgh, PA in 1988 and most recently taught Earth Science at the Charter School of Wilmington, DE. He earned a doctorate from the University of Pittsburgh’s Cognitive Studies in Education Program and joined the faculty of the University of Delaware School of Education in 1995. Dr. Smith received the Outstanding Earth Science Teacher Award for Pennsylvania from the National Association of Geoscience Teachers in 1991, served as Secretary of the National Earth Science Teachers Association, and is a reviewer for Science Education and The Journal of Research in Science Teaching. He worked on the Delaware Teacher Standards, Delaware Science Assessment, National Board of Teacher Certification, and AAAS Project 2061 Curriculum Evaluation programs.